I was warned when I went to interview this accomplished firefighting gentleman of Kenthurst, he is a multi-talented soul! I was still shocked! Nestled next to ‘nearly’ National Park in Kenthurst lives Lionel Smith, 17 years retired but doing more than many men half his age. “Do you realise the RFS attends fires over 90% Of NSW?” he greets me, when I mention I have visited the Metropolitan Fire and Rescue Headquarters in the city. Kenthurst RFB recently realised 75 years of service. Guess who calmly called up the printer of his beloved Mercedes magazine, of which he used to be editor, for advice to layout the 32 page colour history book? “No not PageMaker” they said, so Lionel sat down and learned the industry standard software to compose the entire tome. Remarkable! 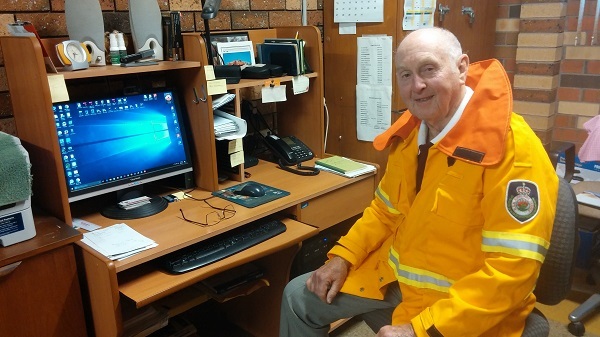 Lionel Smith is one of the amazingly experienced ‘head’ honchos of the Kenthurst Fire Brigade. With many many years of service under his belt, beginning in Oakville in 1946, he tells of brake drum and hammer alarms passed on smoke signal style by neighbours and farmers, they then turning up to fight fires in bare feet and shorts. “But they had feet so tough they couldn’t get burnt!” he jokes. Lionel left there to build his current Kenthurst home and begin life with the lovely Gwen. In the 1970s pagers revolutionised the communication systems. “No radio!” Today, SMS alerts also summon volunteer firefighters to action. Firefighting has come a long long way. Cluster subdivision is slowly progressing, but the progress with emergency services with firefighting since Lionel has been on the scene has been phenomenal. As a Group officer and then Deputy Fire Control Officer in the 60s, fires were fought with a no formal training, nor uniforms and very little equipment; with vehicles being converted military blitz 4 x 4 and 2 ½ ton trucks. As Hills Fire Control with 6-700 volunteers assisting in MVA (motor vehicle accidents) hazard reduction and house fires, he was assisting at the time of the legendary Phil Koperberg, so instrumental in bringing fire funding and control under a coordinated emergency services umbrella. Extensive research led to Lionel inventing the ‘Quenchmaster’ foam dispensing system, the size of a book, manufacturing it himself between 1994-8, which transformed the problematical use of foam in tankers. Training is now mandatory and comprehensive and equipment is superbly engineered to make the job quicker, more effective and safe. Upon retiring, Lionel restored a beloved classic Mercedes Coupe, his wife’s pride to drive, but deemed too precious to deck the supermarket car park now. His skills have no bottom. These days Lionel desists from active frontline firefighting, giving his energies to training, hazard reduction and mentoring new members. They have a lot to learn and look up to! So when the sleepy rural atmosphere of Kenthurst is rent by a full-blown fire emergency, like the 2002 inferno, these stalwart prepared forces are here to pull disaster back from our lives! Salute these lads and lasses, volunteers, families, fundraisers, all. Meet Lionel and the Kenthurst or any Rural Fire Brigade any Country Fair day, station Open Days, or you may see them instructing at the school, fundraising at community events or conducting ‘Firewise’ practical training seminar.